A clean and organized PC is always better than a cluttered PC. One should always keep it optimized for better performance and to maintain its performance and security. Cluster of unwanted programs makes the machine sluggish and clogs hard disk space. Therefore, cleaning is a must but it is not an easy task. Usually, when we try to uninstall unwanted programs, they leave traces behind, or won’t uninstall due to various reasons. So what do you do in such situations? 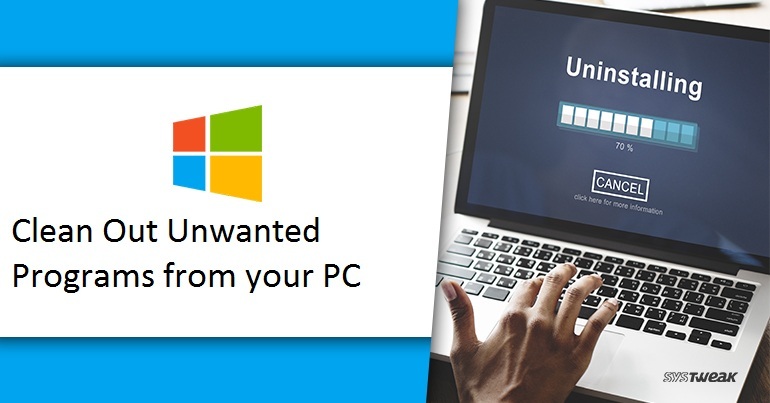 Come along and check out different ways to completely uninstall unwanted programs. The best and most common way to uninstall a software is via Control Panel but that alone is not enough. The old way to uninstall a program is by using the uninstaller present in the folder in Start menu, software folder on the drive. If none of this works, we often access Control Panel > Programs and Features section to delete the software. It is a handy place, to uninstall the program with an additional benefit of displaying all other installed programs on your PC. At times, we get some pre-installed software on PCs with questionable utility and wish to uninstall them but unable to get an option. So how do you do that? Does this mean we can’t get rid of them and will have to live with them? Is there a way to uninstall them? Yes, definitely, you can, uninstall them using PowerShell. Using this command you can uninstall pre-installed programs. Usually the programs that load at system startup locks the system since they silently start and sit in the background. Detecting such programs and uninstalling them is not easy. To get rid of them, we need to use Windows’ Safe Mode, as only the essential apps are allowed to load in Safe mode. Therefore, safe mode is the safest way to uninstall problematic apps. To get into Safe mode hold [Shift] key and select Restart from the Start menu. This way you can boot into Safe mode. Keep pressing [F8] key on system startup/ restart you will get a list of various options on system startup from here select the option using which you want to boot the system. Once you’re in, try to uninstaling the program through Control Panel or use dedicated uninstaller from the installed software. System Restore has always rescued in difficult situation. But, you can only use if if you have set a restore point. If you have a system restore point it will help you to go into the past and make it working as it was before in present. Accidental or challenging installs can be undone using System Restore. Some traces remain even when the program is successfully uninstalled. In such cases you can use uninstaller tools available in market for uninstalling and to cleaning leftovers. There are, a multiple tools that can be used to remove the software, from complete uninstallation to forced file deletion. Sometimes when you open Control Panel to uninstall a program you might see references of a program that you’ve previously uninstalled. Often, you need to remove these leftovers manually, if you do not have a third party software. You can do so by hunting around in the Windows registry, but before doing so make sure you want to do it. Open windows registry by typing regedit in the Run window. To open run window press Windows + R key altogether. From here you can remove the entry referring to the already removed program. All the tips mentioned will help you to remove unwanted and/or leftover programs from your system. This will help to free up space and boost PC’s speed.